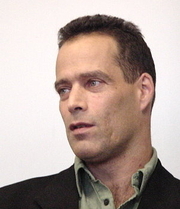 Sebastian Junger has 7 media appearances. Sebastian Junger reads from War. Sebastian Junger is a freelance journalist and award-winning author with expertise in covering dangerous work around the globe. He has reported from such places as Liberia, Sierra Leone, Kosovo, Kashmir, Cypress, the American West and, most recently, Afghanistan. Sebastian Junger is currently considered a "single author." If one or more works are by a distinct, homonymous authors, go ahead and split the author. Sebastian Junger is composed of 8 names. You can examine and separate out names.